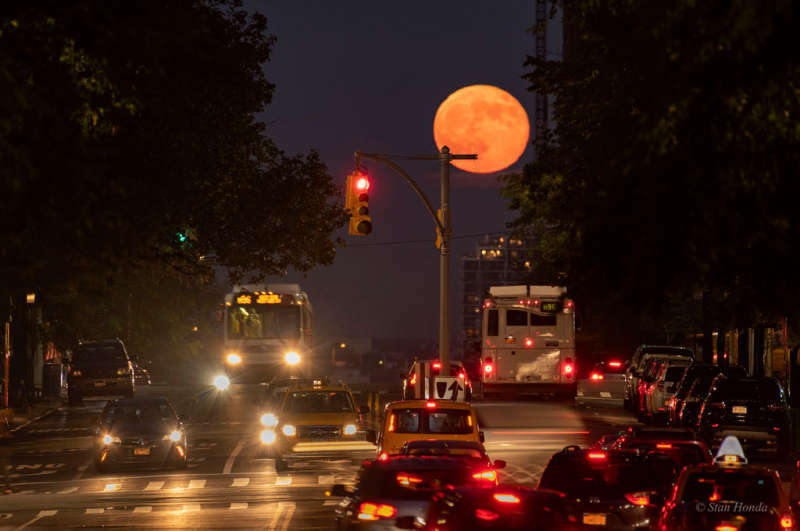 Explanation: A very full Moon rose over Manhattan's Upper Eastside on June 28, known to some as the Strawberry Moon. Near the horizon, the warm yellow lunar disk was a bit ruffled and dimmed by a long sight-line through dense, hazy atmosphere. Still it fit well with traffic and lights along East 96th street in this urban astroimage. The telephoto shot was (safely) taken from elevated ground looking east-southeast from Central Park, planet Earth. Of course, the East 96th street moon was the closest Full Moon to this year's northern summer solstice.